The Sweet Violet is a perennial which means it blooms every year. Sweet Violets grow best when exposed to sun and partial shade in cool weather (-10 ° F to 30 ° F). Sweet Violets can be found from sea level up to 1,400 meters. The Sweet Violet is most often found in open deciduous woods, pastures, moist meadows and swamps. They prefer a rich, moist, sandy soil with a sheltered position. 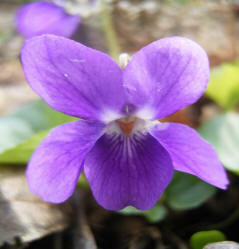 As shown to the left, Sweet Violets can be found in many areas across North America. However, they did not originate in the United States. Along with many regions in North America, Sweet Violets can also be found in most of Europe, northwards to the British Isles, Southern Scandinavia, Lithuania, Central Russia, North Africa, the Mediterranean region and West Asia. Below shows the distribution of Sweet Violets in Wisconsin.